WASHINGTON (CNS) — The year may be coming to an end but the battles on the immigration front promise to continue well into 2019 and beyond. “On immigration, there is no rest for the weary with this administration,” said Kevin Appleby, senior director of international migration policy at the Center for Migration Studies in New York. By far, the most dramatic immigration development of 2018 took place around summer when then-U.S. Attorney General Jeff Sessions announced a new policy that resulted in separating children from parents or other family members traveling with them and then placing the minors in detention centers. But that policy was just one in a long list of what some see as attacks against refugees, asylum seekers, and other immigrants looking to make the U.S. their home. In 2018, the Trump administration announced that the country plans to allow no more than 30,000 refugees into the U.S. during fiscal year 2019 — a record low. It also announced a new policy requiring people entering the country without documents to present themselves formally at official ports of entry as a condition to qualify for asylum — a move that has triggered long waits, deterring most migrants from touching U.S. soil where they can file an asylum claim. Most recently, the administration spoke of a proposal to deny permanent residency to legal immigrants who have used public assistance, often referred to as the “public charge” rule. And around Thanksgiving, it authorized the use of tear gas into a crowd that included children at the border near the U.S. and Mexico, near Tijuana. Throughout the changes and announcements, the Catholic Church, its organizations and members have remained vigilant and active in denouncing some of the policies while also tending to those they have affected. 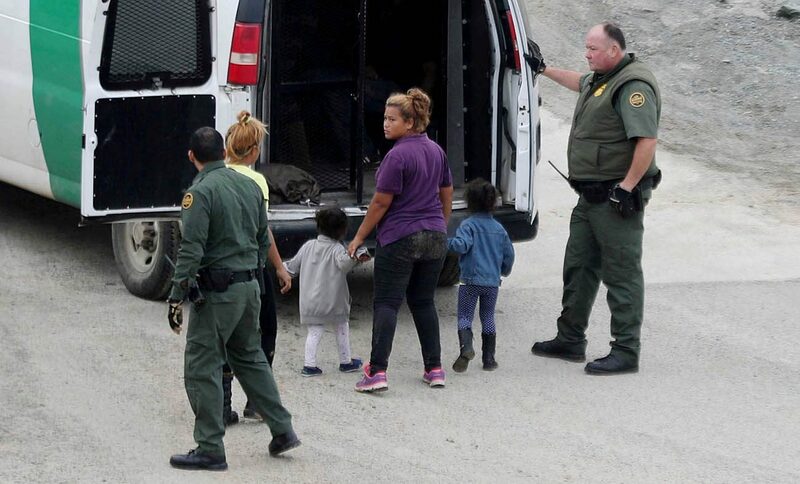 When the Trump administration separated approximately 2,300 children from their parents at the U.S.-Mexico border between May and June of 2018 as part of a new policy to deter border crossings and then later rescinded the policy, the U.S. Conference of Catholic Bishops’ Migration and Refugee Services, Catholic Charities USA and a network of other Catholic agencies from around the country quickly mobilized to help reunite those who were separated. They provided short-term care, such as food and shelter, transportation for some, and served as locales to bring the families together again. With the influx of Central American migrants at the U.S.-Mexico border seeking to flee violence in countries such as Honduras, Guatemala and El Salvador, places such as the Catholic Charities of the Rio Grande Valley’s Humanitarian Respite Center in McAllen, Texas, Annunciation House in the El Paso/Juarez and border region, and other temporary shelters run by the Diocese of El Paso, have been on the front lines of providing the basics, from food to clothes and temporary shelter, to the incoming crowds of migrants. Many of those places have seen Catholic volunteers such as Margie Legowski come through their doors to help. Legowski, a parishioner from Holy Trinity Catholic Church in Washington’s Georgetown neighborhood, traveled to the McAllen, Texas, area during Thanksgiving, to help the migrants at the Humanitarian Respite Center. The center had “a huge influx of people,” she said, sick and exhausted from the trek, but also frustrated and sad at the rigorous process of asylum whose rules the Trump administration was seeking to change at the time. “I saw such sadness, patience and almost giving up,” she told Catholic News Service. There is concern for the human toll of the policies, she said, especially because the U.S. government can use its great resources, including physicians and even the National Guard, to provide assistance to the migrants and not to use its resources to antagonize them. “It’s in no one’s best interest” to do so, Legowski said. At the national level, bishops have voiced their support for migrants and their right to seek refuge. In July, in a highly publicized visit, top leadership from the USCCB traveled to the border region of McAllen and Brownsville in Texas to personally meet with some of them, mothers and fathers, at a Catholic-run temporary shelter. The visit also included a stop at a government detention center for minors who had been separated, a converted Wal-Mart, where the bishops celebrated Mass. U.S. Cardinal Daniel N. DiNardo of Galveston-Houston said then, in a July 2 news conference, that the church supports the right of nations to protect their borders, but having strong borders and having compassion are not mutually exclusive. A solution with compassion can be found, he said. But many worry that compassion is what’s lacking in the policy decisions that have been handed down by the Trump administration when it comes to immigration, and as long as they continue, the concern is for the men, women and children at the border who may suffer the consequences. “I picture the ship turned away … the Jews no one would take,” said Legowski, referencing a German ocean liner the U.S. government, under the Democratic Roosevelt administration, turned away in 1939 carrying Jewish refugees looking to escape the Third Reich. Many of them would later perish at the hands of the Nazis.